Новая версия лучшей программы для работы с образами дисков UltraISO. Создает, конвертирует, редактирует (добавить, удалить, извлечь файлы), и, что не характерно для программ такого типа — записывает образы на CD/DVD носители. Несомненный лидер по количеству поддерживаемых форматов: ISO, BIN/CUE, IMG/CCD/SUB, MDF/MDS, PDI, GI, C2D, CIF, NRG, BWI/BWT, LCD, CDI, TAO/DAO, CIF, VCD, NCD, GCD/GI, VC4/000, VDI, VaporCD и куча менее популярных. Поддерживаются функции виртуального CD-ROM'а. - Can directly edit the ISO image file. 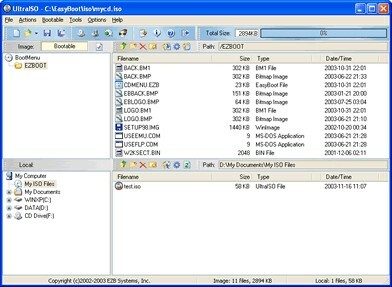 - Can add / delete /create new directory /rename ISO file image content. - Can make ISO file from hard disk document. - Can create CD/DVD image from CD/DVD-ROM, maintain bootable information. - Can process the compact disc boot information, you can directly add/remove/extract boot image of the ISO image. - Supports nearly all known CD/DVD image file formats (.ISO, .BIN, .IMG, .CIF, .NRG, .BWI and so on) , and converts them to the standard ISO form image. - Automatically optimizes the ISO image file structure, saves the disc space. - Supports the shell document type integration, Open Image files through double clicking them or the Right Click menu of the mouse with the open dialog. - The double window user interface is extremely convenient to use. - There are rich add-on tools, you can create ALL in 1 bootable compact discs, CD/DVD image file management, even the virtual CD/DVD drive , those functions are really powerful.